Classic and Modern Fabrics: The Complete Illustrated Sourcebook, has been written to fill a need for a book that comprehensively catalogues and describes a wide variety of fabrics. There are 320 pages with 834 colour illustrations and descriptions of over 600 fabrics from the well-known classics such as tweed to innovative new products such as moisture transport textiles. Each entry includes an outline of the fabrics defining characteristics, construction details, and a photograph to aid recognition. Some background history and information on typical end uses have also been provided. There is an extensive cross-referencing system and a thorough glossary and bibliography. The book concentrates on textiles in current use, but it also covers obscure or obsolete terms that one might come across, and that might still have something to teach today’s designers, manufacturers and textile historians. 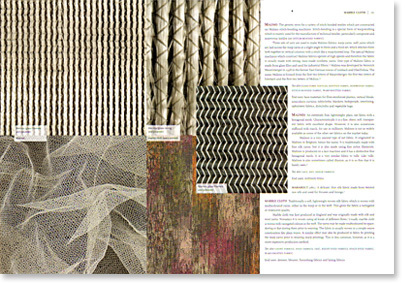 to serve as a sourcebook providing detailed information about all the major fabrics and textile materials available today. to explain the characteristics of different types of fabric, thus allowing readers to assess their suitability for particular end uses. to inform professionals involved in the textile and clothing industries about the construction and production of the various classic and modern fabrics. 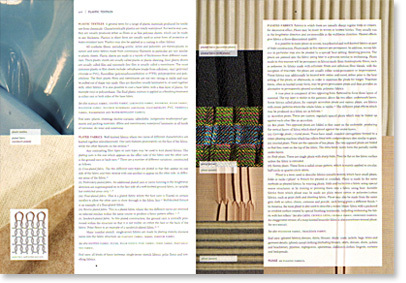 to provide information on a range of new developments in fabrics. 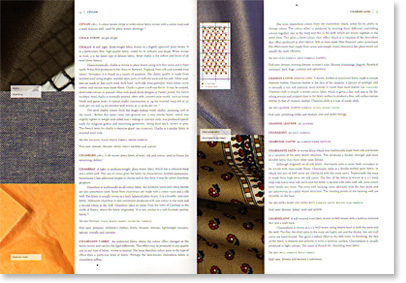 to provide information about particular fabrics that could be produced for special niche markets. to preserve our knowledge of the diversity of classic fabrics which are our cultural heritage. Classic and Modern Fabrics is an invaluable resource for anyone working in the textile, fashion and interior design industries, fashion and textile students, and anyone who needs to source fabrics. It would also be of interest to textile and fashion historians and anyone who has an interest in the beauty and diversity of the textile fabrics that are a part of our cultural heritage. Changing markets make it vital that professionals involved in the textile and clothing industries are familiar with the vast range of fabrics that can be produced. In today’s commercial climate, where economics usually dictate which fabrics are manufactured and sold, it is not only important to be aware of new fabric developments, but it is also important that the wide diversity of fabrics that have been produced historically should not be lost or forgotten. These fabrics have proven their value over time and can be adapted to create new products that meet the requirements of the present day. It is therefore of benefit to everyone that the knowledge of this aspect of our cultural heritage should be retained. Many fabrics do not have a specific name, but there are numerous others that do. These tend to be the ‘classic fabrics’ that have been reproduced time and again throughout history, either because they are of great practical value or because they are exquisitely beautiful, and sometimes for both of these reasons. Fabrics such as canvas, flannel, tartan and velvet have been widely used for many centuries and continue in their popularity today. Others, like bridal satin, tend to be used more rarely, only for special occasions. Others again, like tapestry and ornamental batik, are expressions of an artistic or technical excellence in craftsmanship. In this respect, they fulfil a cultural need. They are essentially works of art, which are more likely to be collected and displayed on walls than put to any functional use. All these are examples of classic fabrics. More recently, there have been a great many new developments and technical innovations, such as microencapsulated textiles and moisture transport textiles for example, that are making a great impact on our lives and changing the way we think about and use textile materials. The technology of microencapsulation has lead to a variety of new products including ‘perfumed fabrics’ that gradually release a fragrance over time, while moisture transport textiles, with their increased ability to wick perspiration, have also prompted the creation of many novel products such as 'breathable' sportswear and rainwear. The use of microfibres in particular has yielded a whole new range of strong, breathable, lightweight garments that are comfortable to wear and often water repellent. These are all examples of 'modern fabrics'.